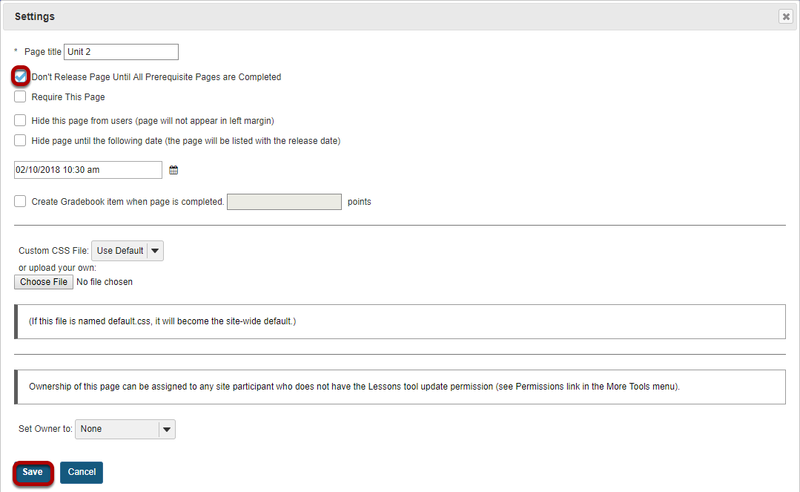 Sakai Community DocumentationSakai 19 User Guide (English) LessonsHow do I require completion of a Lessons page? Instructors can require the completion of one Lessons page or subpage before allowing students to move on to subsequent Lessons pages or subpages in the Lessons hierarchy. That is, instructors can require all of the required items on one page to be completed before students have access to subsequent Lesson pages or subpages. See How do I require one Lesson item to be completed before another Lesson item becomes available? for directions on requiring an item on a page to be completed. Specify required items on the page. Zoom: Specify required items on the page. See How do I require completion of a Lessons item? for directions on requiring an item to be completed. Note: Required items are indicated by an asterisk. See How do I require completion of a Lessons item? for directions on conditionally releasing an item based on prerequisites. 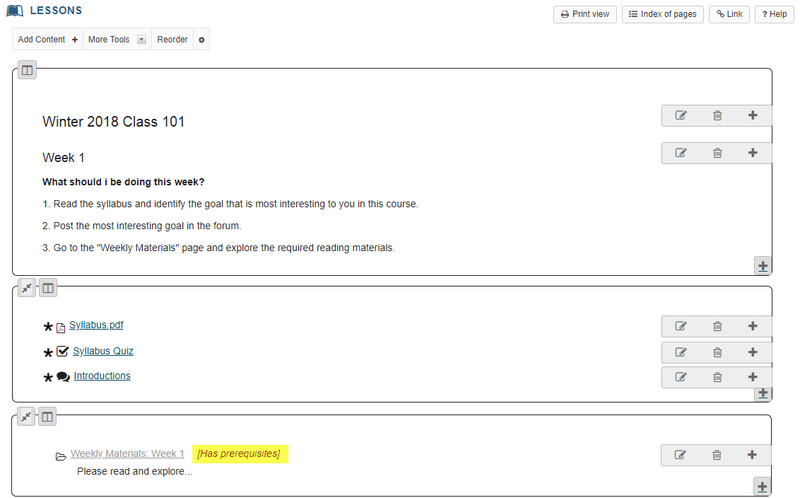 Note: that the subpage link (or button) now displays the text [Has Prerequisites] next to the item. The Settings icon is a gear-shaped icon in the top right corner of the page. Check Require this page, then click Save. Zoom: Check Require this page, then click Save. 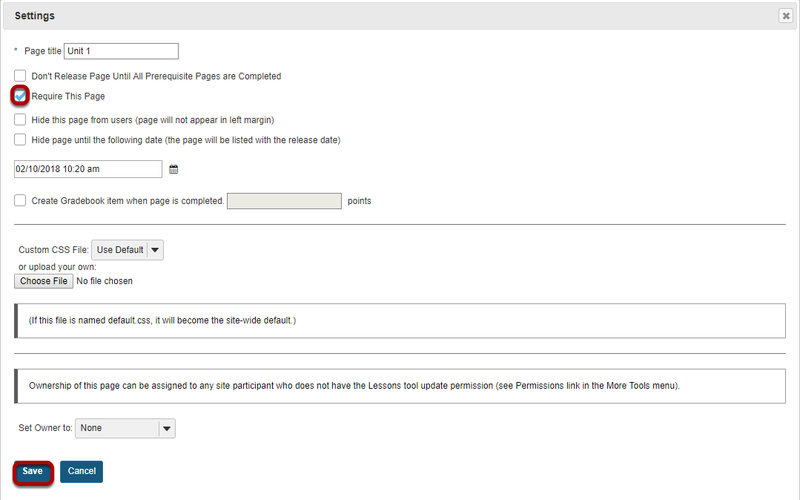 Check Don't Release Page Until All Prerequisite Pages are Completed, then click Save. Example of a top-level Lessons page that must be completed. Zoom: Example of a top-level Lessons page that must be completed. 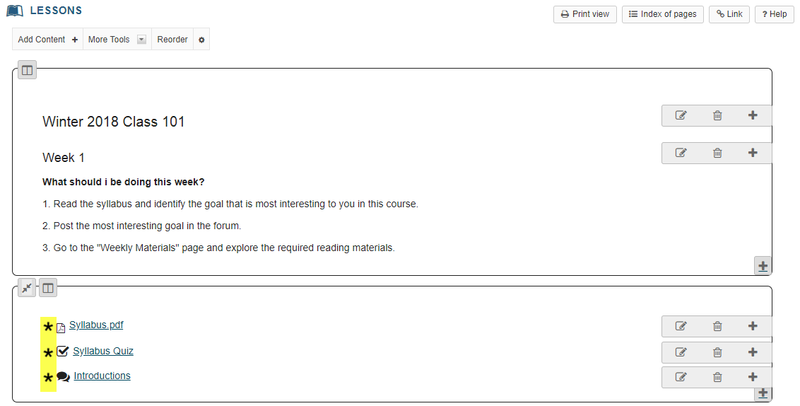 The Unit 1 Lessons page items must be completed before a student can access the Unit 2 Lessons page. Prev: How do I require completion of a Lessons item?